Directions: Take 2 capsules to 3 times per day. Do not exceed 6 capsules per day. Maximum period of daily use: 3 months. Use may resume for 3 months after a 2-week break. This product is based on a strong 30% extract of Kava, so please use with caution and care. With the synergistic effects that our carefully-crafted herbs, this can be a surprisingly powerful natural stress reducer. Several of our staff here have integrated it into their daily routine. I personally use it almost every evening to help me ease into the night, and give me some of the best rest I've had in quite some time. 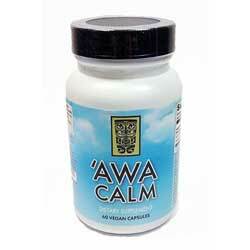 Some over the counter medications give me vivid dreams, but 'Awa Calm has no side effects, it doesn't leave me drowsy in the morning, and it's gentle enough to use during the day if I wish as well. Full Ingredients List: Kava Root Extract (30% Kavalactones), Hops Flowers, Lemon Balm, Passion Flower, American Calamus root, Vegan Capsule.